Today’s project is a cheat! There is no actual pin for it. 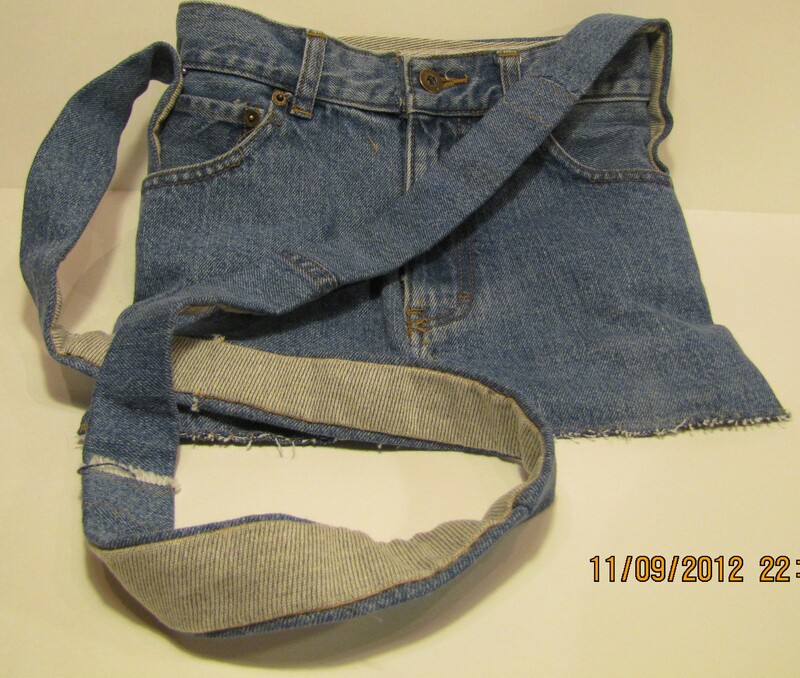 It was, however, inspired by the denim apron in Tutorial #1. It is a bag. I actually still have to sew the buttons on the side and the strap, but I decided to share this one because I couldn’t find a lamp shade that was suitable for the bottle lamp I made! Go figure. Sometimes I struggle so to find the right accessories. These instructions are non-specific. Measurements are variable depending on your jeans size. All stitching is zigzagged with wrong sides together. Cut the Front just above the crotch so that the front will lie flat. I had to cut the waistband and fold it under the zipper and secure. Just work with it. For the back of the bag, cut a piece of the leg to the same height as the front. Make a pocket out of the coordinating fabric and stitch to back. Stitch the front to the leg on both sides. 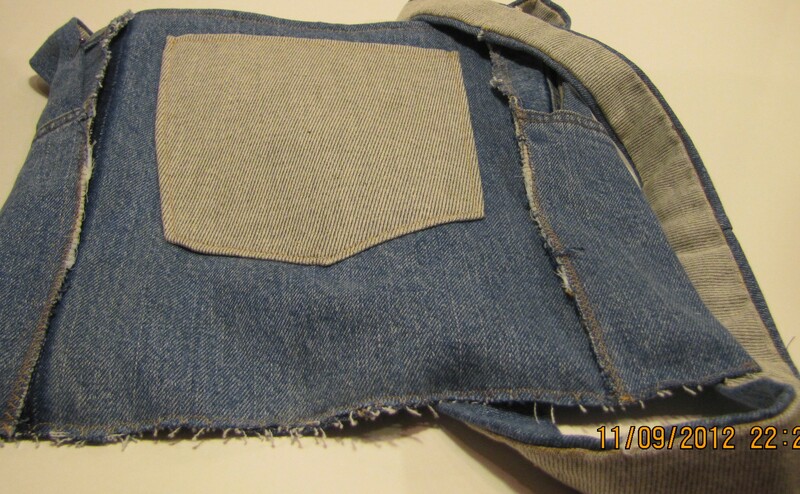 Fold the front sides to the back, leaving the zipper at center front. Press. Measure the bag and cut lining from coordinating fabric leaving ½” seam allowances on both sides and the bottom and 1” seam allowance on the top. 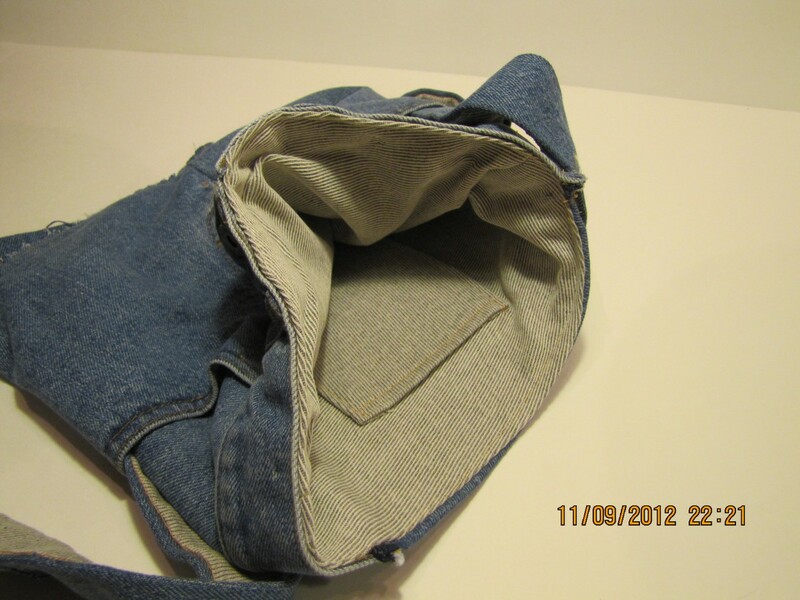 Make a pocket for the inside and sew to right side of lining. Seam sides and bottom of lining. Insert lining into bag, fold under top edge and stitch to bag. 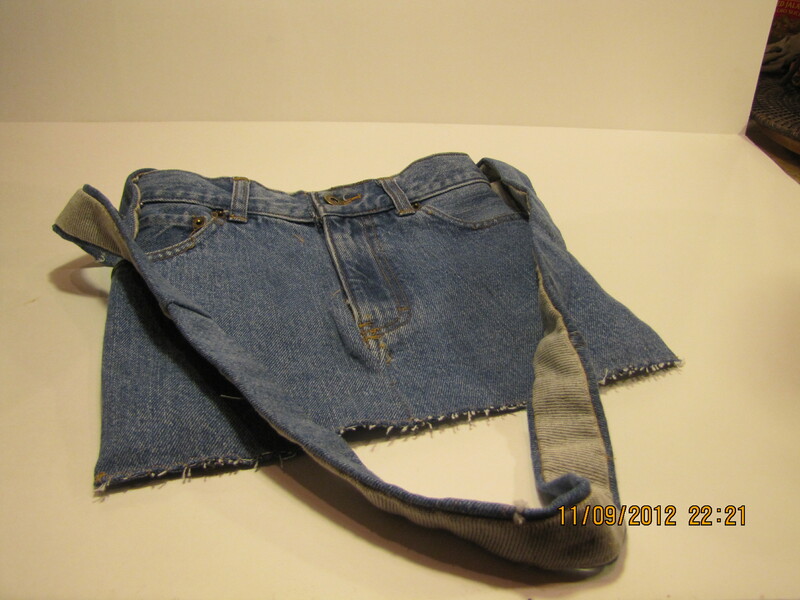 Using remainder of jeans leg, cut strips 1-3/4”-2” wide and stitch together to form strap of desired length. Cut a strip of the lining fabric to match the strap. Fold strap lining edges under and to the center. Press. Stitch strap and lining together. Attach strap to bag. I am adding buttonholes to my strap and buttons to the side of the bag. You can just sew it on, or use snaps. Add a magnetic closure if desired. I’m actually rather fond of this bag. Think I’ll use it tomorrow. Just when I sent all my old jeans to Savers…..wonder if I can get a pair back? All for a good cause!